A weekend leisure reading review…because sometimes Pastors also need a break from heavy theological reading! Paul Dini. Batman: Private Casebook. New York, NY: DC Comics, December 23rd 2008. 160 pp. This is another comic book on Batman. This particular title is a collection of seven short stories or mini-chapters of short stories. The writer Paul Dini was the producer and screen writer for Batman: The Animated Series and if you enjoyed those cartoons in the 90s you will also enjoy the same feel of short episodes in this book, though the illustrators did vary from story to story. Overall it was a fun read. The last five nights and days has been long so I’m getting a little breather today from the ministry. Here’s a fun read review as a mental break. Enrico Marini. Batman: The Dark Prince Charming Book One. Burbank, CA: DC Comics, November 6, 2018. 144 pp. This is a comic book written and illustrated by a European artist name Enrico Marini. It is an exciting take on Batman versus Joker from the perspective of an European artist. I thought Marini did a good job telling this story. Sean Murphy. Batman: White Knight. Burbank, CA: DC Comics, October 9th 2018. 232 pp. I have been anticipating this story ever since I made my first or second visit to the comic bookstore and I overheard the clerk tell someone about this. And it did not disappoint! Which is why I gave this a five out of five. This volume marks the debut of the publisher DC Comics’s new Black Label imprint which feature well known characters in DC universe in new stand-alone stories without necessarily continuity that affect the stories being told in the regular comics. I love the originality of Batman: White Knight. This work collects an eight issue miniseries in which the writer and artist Sean Murphy presents us a scenario of what would happen if the Joker goes sane. But it was also so much more than that! This book comes out today! Thanks to DC Comics for the advance review copy. Tom King. Batman Volume 8: Cold Days. Burbank, CA: DC Comics, December 24th 2018. 176 pp. The adventure with Batman continues! This eighth volume of Batman collects Batman issues # 51-57 in DC’s Rebirth era. Being released in December there is a winter theme to the stories collected in this comic book. A weekend review of a light-hearted reading, because sometimes Pastors needs a break from heavy theological reading. Tom King. 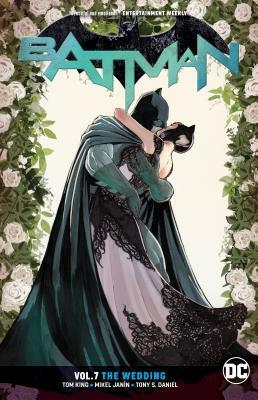 Batman: Detective Comics, Volume 7: The Wedding. Burbank, CA: DC Comics, October 30th 2018. 176 pp. This is volume seven of Batman in DC’s Rebirth era. The volume collects Batman issues # 45-50. A weekend comic book review, because sometimes even Pastors need a break from heavy theological reading. Tom King. Batman Volume 6: Bride or Burglar. Burbank, CA: DC Comics, December 19th 2017. 168 pp. This is the sixth trade paperback volume in the DC Comics’ Rebirth reboot series on Batman. The book collects issues #38-43. This particular volume gives us three stories that feature Batman but also Catwoman by his side, whether in a small role or a larger role. Dwayne McDuffie. Batman: Blink. New York, NY: DC Comics, February 24th 2015. 168 pp. This volume is a reprint of some older Batman issues (the original work was not in 2015). This book collecting Legends of the Dark Knight issues 156-158 and Action Comics 847 and presents two story concerning a blind character name Lee Hyland. Originally I wasn’t going to read this book since it looks like “90s stuff” but it turned out to be better than I anticipated.